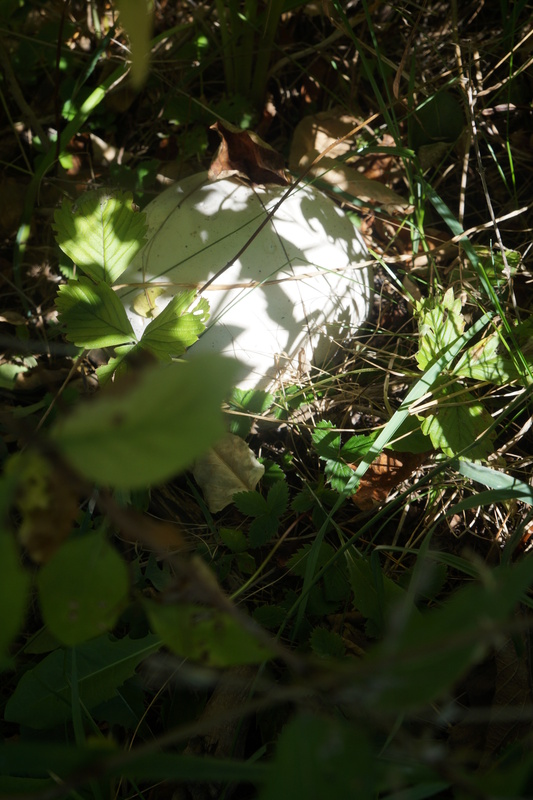 I considered myself lucky this year when I found a healthy puffball behind my tool shed, and referred to it in a recent post on how to identify and use it in cooking. Now these puffballs are mushrooming all over, and by the number of posts from other blogs on the subject, it’s a good year not just in my garden. I recently found four more good sized balls, one of which I left to help ensure some spores remain for next year. There is no point finding these gifts if you don’t know what to do with them. Their shelf life when fresh is short. Frying lightly and freezing is one option, and I have dehydrated some as well. But when faced with the quantity I had, I wanted to be able to store them in as efficient way as possible, meaning something that required little work and little space. I started to search to see if anyone else had dehydrated them, and if so what they do with them. Forager Chef, one of my favourite foraging blogs gave me the answers I was looking for. He dehydrated them, ground them into a flour, and made a very appetizing looking gravy. So I set about peeling and slicing my puffballs into thin slices resembling sliced bread. He suggests drying them in an oven with the light on which I tried. I also did some in my dehydrator at a low temperature – about 107 F or 42 C. The dehydrator took only about 12 hours – the oven three times longer. However you do it, the slices should still be white when dry and crisp. If the heat is too high they will brown and will affect the colour of the flour. 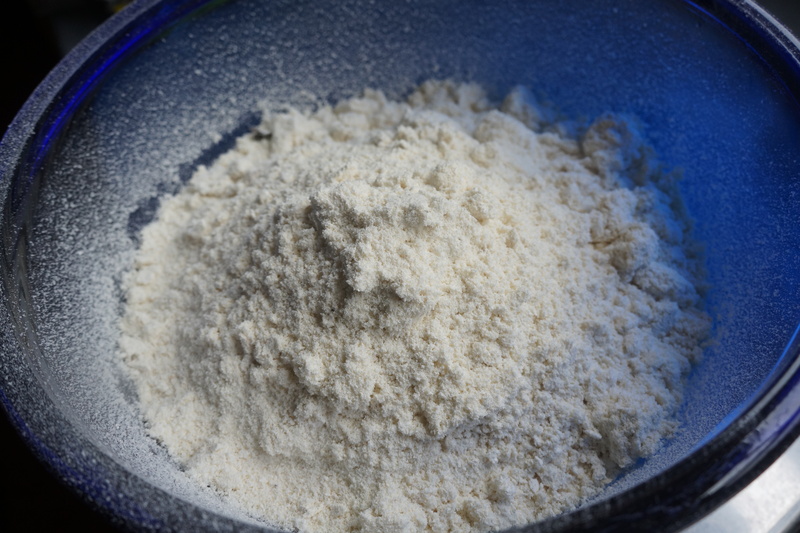 A really powerful food processor is all you need to turn them into flour in just a few moments, but lacking that I used a not so powerful processor followed by a few seconds in a coffee grinder for a finer powder. This last step can be done on an as-need basis. I can think of several ways this flour can be used but so far have just tried Forager Chef’s mushroom gravy recipe. I adapted it for a small quantity since unlike him I am not cooking for large numbers. I started by heating 1/2 cup mushroom flour and 1/4 cup of water. You need a good deep pan for this, as initially the flour will puff when stirred. Heat and stir until most of the water is absorbed and it resembles a roux. In another pan, mix 3 Tbsp of fat (i used a mixture of butter and olive oil) with 3 Tbsp of flour. Stir over a low heat, and gradually add 2 cups of stock. 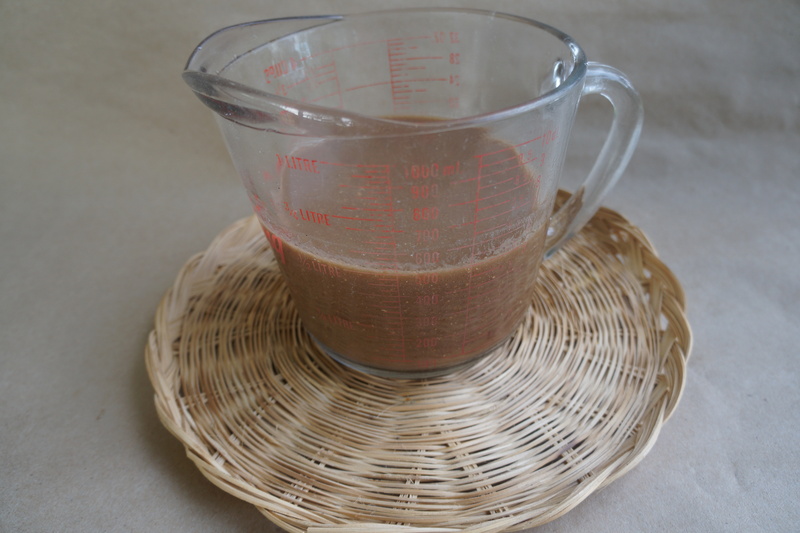 I used a vegetable stock which had good colour having prepared it with onion skins among other herbs and vegetables, but any meat, fowl or vegetable stock can be used. When the stock has thickened sufficiently, stir in the mushroom mixture and bring to just below boiling. Season with salt and white pepper. 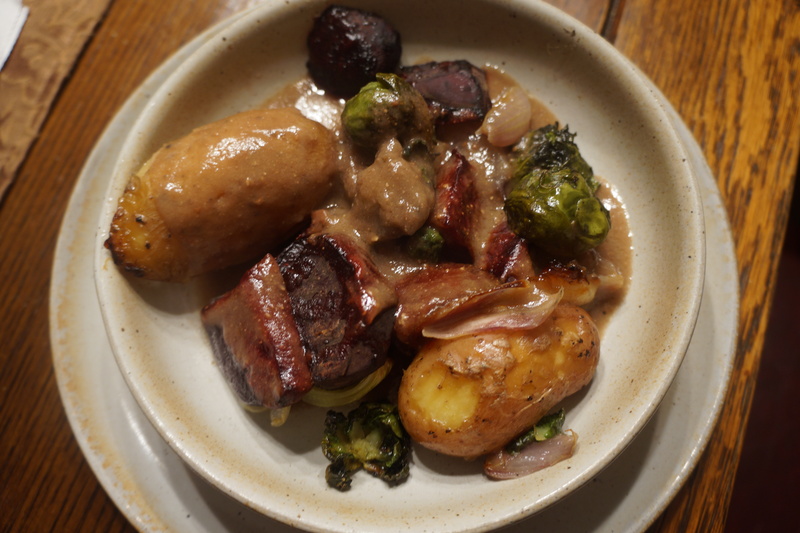 This gravy was smooth and flavourful. I served it over some roasted vegetables from the garden. Because it is vegetarian, and could easily be vegan by omitting the butter, it is a very useful recipe to have, but good enough that there’s no need to be a vegetarian to enjoy. Categories: edible weeds, foraging, mushrooms | Tags: mushroom flour, mushroom gravy, mushrooms, puffball mushroom, vegan, vegetarian | Permalink. This is fabulous. I never knew about mushroom flour before. My motto is ‘if you don’t know what to do with it, make flour’. I find dehydrating mushrooms, like other things, really intensifies the flavour, so very worth doing. But did it taste mushroomy? I should have mentioned in the post that yes, it had a very definite mushroom flavour, but not too strong. Really delicious. I will make it again. Wow, this is amazing! How lucky to have found such a wonderful mushroom, and the idea of turning it into flour is just great! Very innovative. What more can I say? your posts always leave me refreshed with wonder. The gravy really looks smooth and delicious. Thank you for teaching me something new! Wow! I thought it was a rock. Then realised it’s a mushroom from your description. And it turns into flour? That’s so amazing!! I love this! That dinner looks fantastic. I’m hungry just looking at it – mushroom flour or not. I’m sure the gravy is amazing! This is so new to me. But yay to successful endeavors!